Origin Access Premier doesn't show BF V anymore?! I have an Origin Access Premier account and added Battlefield V to my games library some weeks ago. Today, I don't see the game anymore, it's not in my library and not even in the Origin Access games vault... Do you have any infos about that? Is it OK if I freak out until then? There is no need to worry, the BF V will available from 7th Nov. for the Pre Loads. This is normal, the same is for every other players. The game will be available from tomorrow on the Origin game library. Hi guys, I just wanted to let you know that we are looking into the reports of this. I have the same problem. Till yesterday I saw both version. the Premier and my preordered. Now I only see my preordered with start on 15th of November. Same here, its gone from my library. Does this mean the pre-order Deluxe version is a different download than the Origin Access Premier one? I have pre-ordered and have the Deluxe version in my library ready for pre-load. I'm thinking of getting Premier for a month in order to get earlier access, but does this mean I need to download the same game twice? Or is it possible to just install and play the pre-ordered one at the Premier release-day and keep playing it after I'm done with the subscription? Does this mean the pre-order Deluxe version is a different download than the Origin Access Premier one? When BF1 launched I had used the 10 hour early trial from Origin Access and I did not need to re-download anything. I bet it will be the same this time. Just spoke to support Australia about this and he said many are getting the issue and its not a bug,just wait till 12am tonight(for OCE) and it will pop to pre load.So i said ok and thanks. Then it popped into my library anyways a moment ago. 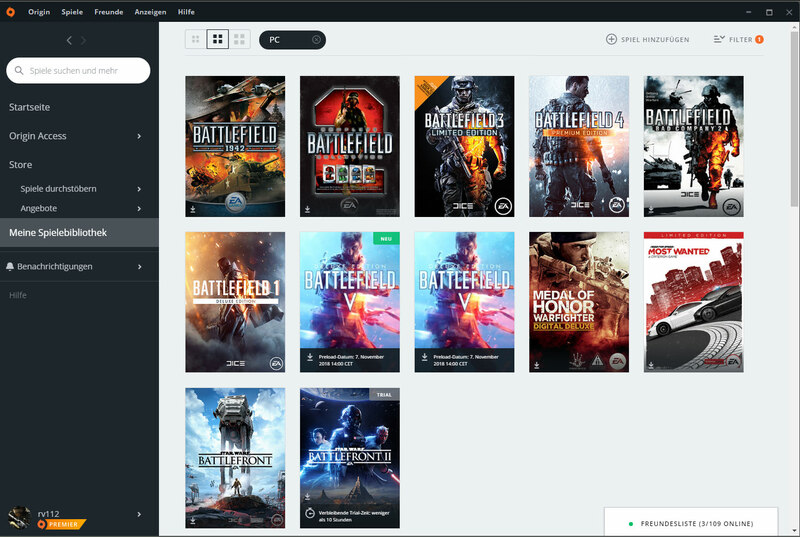 1: Open Origin and highlight browse games under store then highlight battlefield, then click battlefield V. you should then see a tab to add to Library, click that and it should show up for you.